Duggan’s Serra Mortuary has been doing business in Daly City since 1963 and drives over $22 million in revenue for Daly City every year. It is the number one family-owned funeral home in the State of California. Due to its growing business needs, Duggan’s Serra seeks to expand into a new building adjacent to its existing facility. The new three-story 52,000 square foot facility will accommodate events for up to 500 people and features multipurpose reception rooms, two chapels, a great hall, kitchen, and office or retail spaces. Structured parking is included on the lower floor. 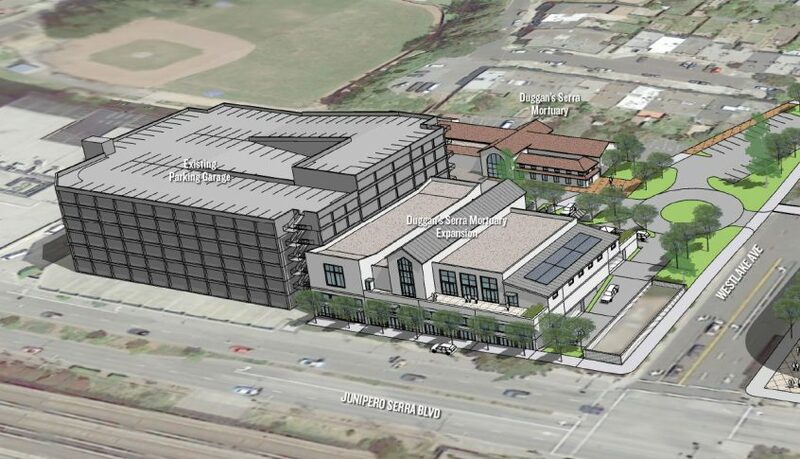 This new building would be part of a lush modern Mission style-inspired architecture similar to Stanford Shopping Center, Stanford University and Santa Clara University campuses. Its architecture would complement the traditional existing facility while new landscaping and pedestrian paths would create a campus-like environment. Multipurpose event reception facility accommodating 500 people. New frontage on Junipero Serra Boulevard. Integration of two chapels for funeral services. Structured parking with liner retail and office. New pedestrian connections and site landscaping.